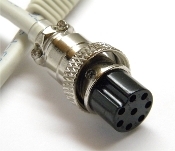 This radio cable is compatible with virtually any radio that has an 8-pin Round type Mic jack. For a list of compatible radios please click here. See "Related Items" below for a link to these modules.